It might be started at the border of neutral waters, around 5-10 km from shoreline and later expanded along major submarine cable systems. and cooled by external medium (also water). ps. Original images are from this really cool site. Update on November 14, 2010. Here's another technology to get electric power for DC. Swedish company Minesto's underwater kite resembles a child's toy as it swoops and dives in ocean currents. 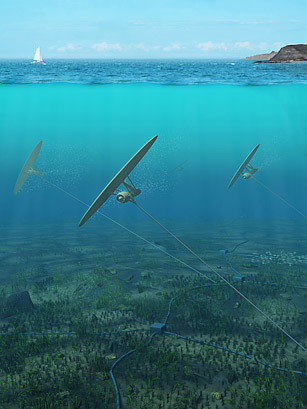 But since seawater is 800 times as dense as air, the small turbine attached to the kite — which is tethered to the ocean floor — can generate 800 times more energy than if it were in the sky. Minesto calls the technology Deep Green and says it can generate 500 kilowatts of power even in calm waters; the design could increase the market for tidal power by 80%, the company says. The first scale model will be unveiled next year off the coast of Northern Ireland. In a similar vein, I have researched the top 20 Hydroelectric sites in the world. If we can put datacenters there, low cost power and cooling, we could carry Internet over AC power lines to the world. Easy to plug in!